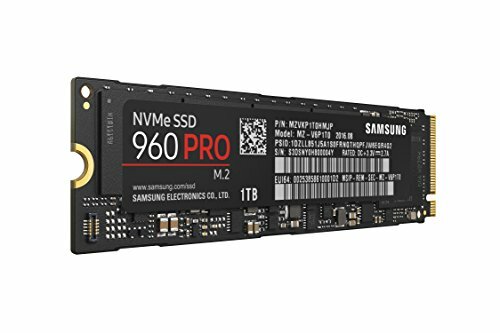 Continuing with the company's trend of stylish looks, this new NVMe SSD is also quite cheap for the genre. 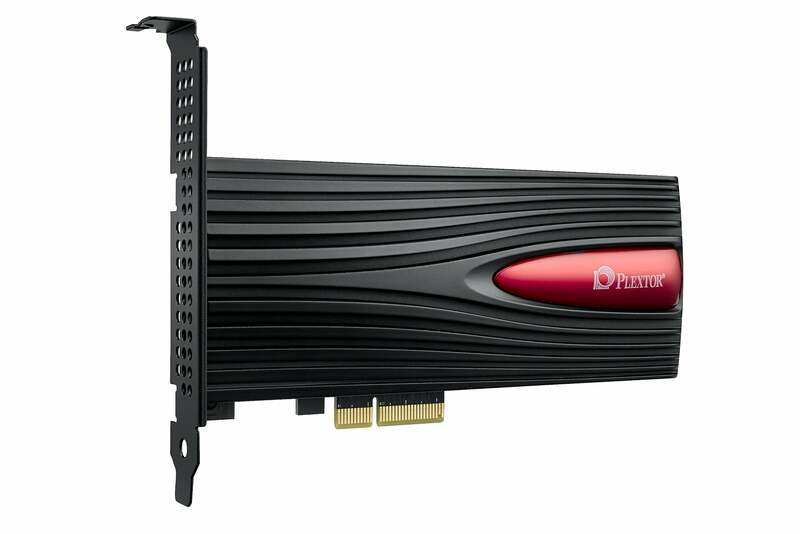 Plextor continues to make hay in the enthusiast market with the stylish heat sinks on its NVMe drives. However its latest, the M9Pe, while stylish if you want it to be, is more about performance for the price—as low as 40 cents per gigabyte, which is very affordable for NVMe and lmost as cheap as Intel’s 760p, for which the M9Pe is a more-than-worthy competitor. NVMe stands for Non-Volatile Memory Express. The non-volatile memory is NAND in most cases. Non-volatile means it retains its contents without external power, and 'Express' refers to the PCIe (the lowercase 'e' stands for express) bus that it uses to transfer data. Why do you want it? For write speeds up to six times faster than SATA. Note: Your motherboard must support NVMe if you want to boot from an NVMe drive, though they will work as secondary storage on any system. Trust us, you want to boot from NVMe. The M9Pe ships in three capacities (256GB, 512GB, and 1TB) and three flavors. The M9PeG M.2 model with heat sync we tested can be had for $122, $221, and $427, respectively. The M9PeY on a PCIe slot adapter card costs $147, $246, and $452, respectively. Finally, the bare (no fancy heat sink) M9PeGN goes for only $110, $210, and $415, respectively. That latter is about $10 less at each capacity than the Intel 760p. All the M9Pe drives use a Marvell 88SS1093 controller and Toshiba 3-bit TLC, BiCS3 layered NAND. The M.2/NVMe M9PeG with heat sink that we tested proved a capable performer, and a better writer by far than Intel’s 760p. We tested the 1TB version of the M9PeG shown above. 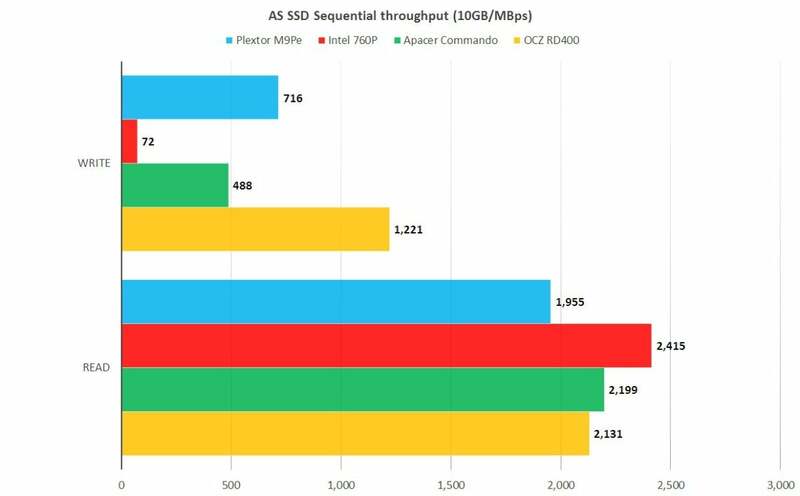 While the 512GB version should perform almost on a par with the 1TB, you’ll see a significant drop-off in write performance with the 256GB version, because it has fewer channels to spread the writes across. This is not an uncommon phenomenon, though some drives do retain their speed in the lower capacities. If you don’t have a M.2/NVMe slot, you can opt for the M9PeY, which comes on an adapter card with an attractive and heavy-duty heat sink thrown in for good measure. The M9PeY shown above is not just for those who lack M.2 slots. It’s also meant to make a statement in gaming systems, with their always-popular transparent panels. We did not test a M9PeY, but based on the product literature and our experience with the M8Pe, there are lights that add to the appeal. Despite its relatively low price, the M9Pe is warrantied for a full five years and is rated for 160 TBW (TeraBytes that may be Written) for every 256GB of capacity. 10TB is more than the average user will write in a year. If you're still using your M9Pe in 16 years, then Moore’s law will truly be dead and buried. 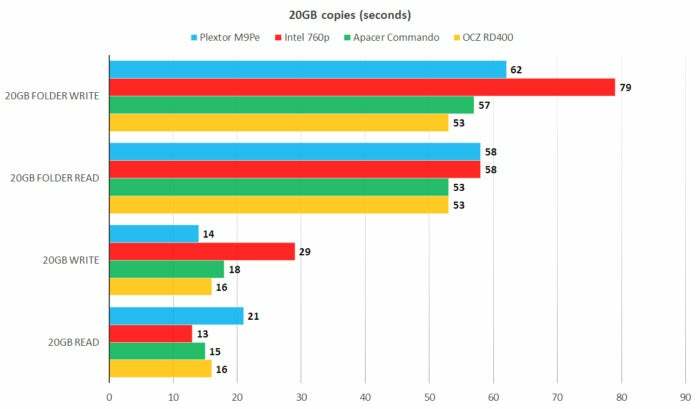 Based on the results from the AS SSD throughput test, the M9Pe (turquoise bars below) is a fast SSD, if not on a par with Samsung’s uber-fast 960 Pro (red bars below). 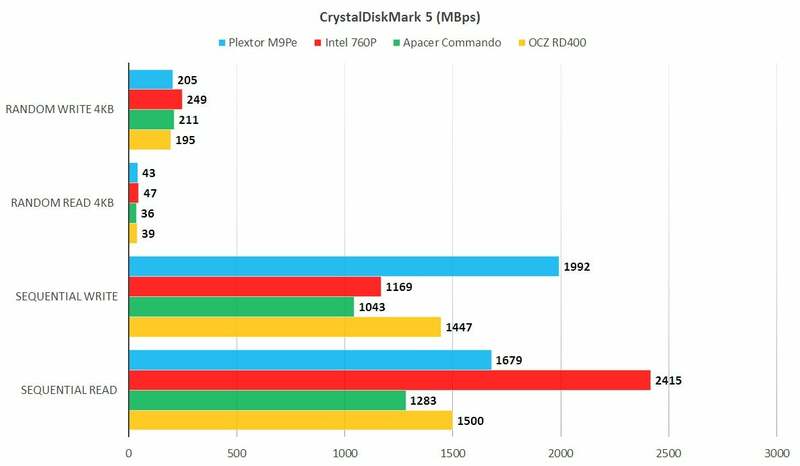 Note that it doesn’t suffer as large of a drop-off as the Intel 760p does when it runs out of cache—it tables off at the 700MBps level, where the 760p drops to around 575MBps. You’ll probably see this mild drop-off (we’ve seen much, must worse) occur sooner in the less capacious models of both drives, as the amount of cache is almost universally implemented as a percentage of available NAND, not a set amount. The M9Pe is no barn burner in AS SSD, but it's certainly better than its M8Se predecessor (not shown) which fell apart when the FUA command was issued. The sequential write numbers below from CrystalDiskMark 5 are extremely optimistic. The M9Pe (red bars below) slows down during long writes, a behavior that CDM doesn’t even hint at. Though hardly on par with the Samsung 960 Pro, the M9Pe will give you that boost in performance you're looking for. You can see a visual representation below (thanks Microsoft!) of the slowdown that occurs as the cache tops out during a long copy operation. 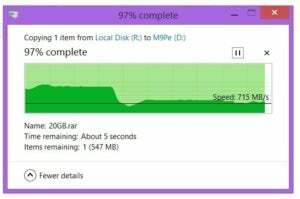 It’s annoying, but not stunningly so, as we’ve seen with some TLC (3-bit NAND) SATA drives. Copy operations of this length are rare for most users, so in day-to-day computing, it won’t affect your satisfaction with the M9Pe. As you can see, write performance didn’t sustain at initial levels. Still, 700MBps is a pretty fair pace compared to SATA. Our 20GB copy times confirmed the slowdown for the M9Pe (turquoise bars below), and also showed the competing Intel 760p (red bars) is far worse. Yes, the M9Pe is a bit slower writing that other drives, but it's an absolute champ at writing compared to Intel's 760p. The M9Pe isn’t the fastest NVMe SSD out there, but it’s certainly a match for the Intel 760p, and it's superior when writing large files. The M9Pe is also one of the most attractive when a heat sink is in play, and super-affordable compared to anything but the aforementioned 760p. We do, however, recommend that you to go for at least the 512GB model for top performance, if you can afford it. 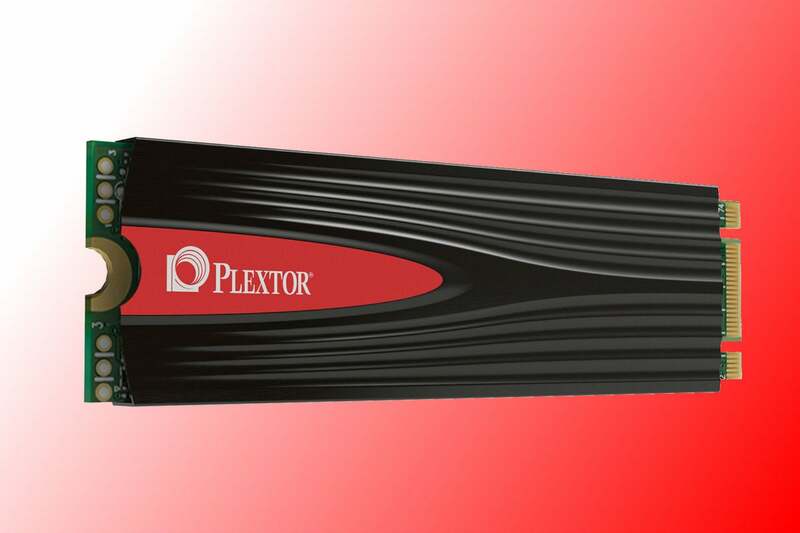 Plextor's latest NVMe SSD delivers big time on looks and price, while still providing adequate NVMe performance with read speeds three times as fast as SATA, and write times twice as fast except during exceptionally large data transfers.